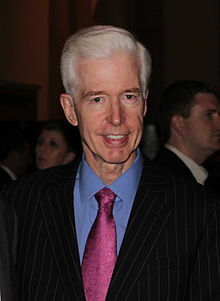 Joseph Graham "Gray" Davis, Jr. (born December 26, 1942) is an American retired politician and attorney. Davis served as the 37th Governor of California from 1999 to 2003. He was a member of the Democratic Party, only months into his second term, in 2003 Davis was recalled and removed from office, the second state governor successfully recalled in U.S. history. Before serving as governor, Davis was chief of staff to Governor Jerry Brown (1975–81), a California State Assemblyman (1983–87), California State Controller (1987–95) and the 44th Lieutenant Governor of California (1995–99). Davis holds a B.A. in history from Stanford University and a J.D. from Columbia Law School. He was awarded a Bronze Star for his service as a Captain in the Vietnam War. ↑ Salladay, Robert. State of Transition: End of the Davis era, Tempered temperament led state. The San Francisco Chronicle. Wednesday, November 12, 2003. Retrieved August 22, 2007. This page was last changed on 19 March 2018, at 01:13.